It’s 10 am and in Dhandhuka town of Ahmedabad district, the sun is already scorching. A dry lake, which was desilted and deepened a few weeks back, has been turned into a venue for a fete. Shamianas have been erected, women in bright sarees and men and children in their best clothes flock the venue, drones hover overhead, recording the festivity. No one seems discouraged by the sun. Villagers have gathered for the culmination of the month-long Sujalam Sufalam Jal Sanchay Abhiyan, a campaign to enhance the capacity of dams, ponds, canals and contour trenches by desilting and deepening them. 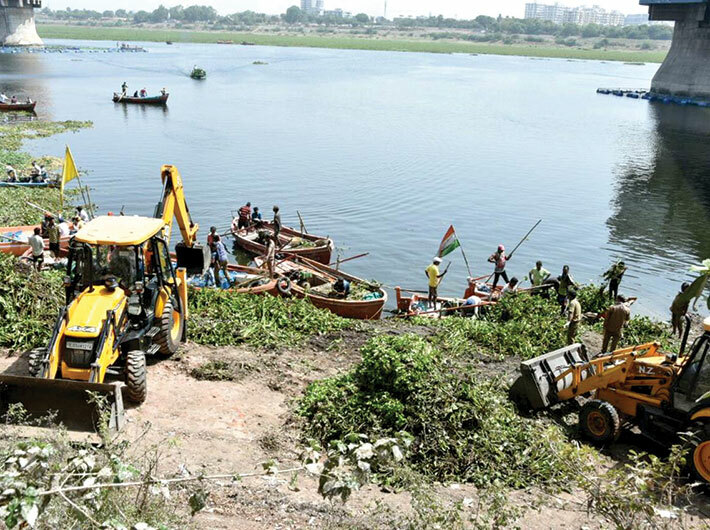 Around 13,000 ponds and checkdams have been desilted and 32 rivers rejuvenated, creating additional capacity of 11,000 lakh cubic feet to store water when the rain arrives. There’s a stage for the main event, and another section for the Narmada Jal Pujan, where priests are performing rituals. Hundreds of villagers have gathered, and among them is Devshribhai Narayanbhai, of Sangasar village in Dholera taluka. A pond created under the campaign is being inaugurated, and he is all praise for the government. “Work on deepening of khet talavdis (ponds in farmlands) in my village is still in progress. There is no water problem in my village,” he says matter-of-factly. Villagers aren’t angry, he says, even after the government plugged the use of Narmada water for irrigation in March, and instead use water from khet talavdis to water their fields. Initially, the campaign used 527 earth-moving machines and 2,000 tractor-dumpers, and employed 27,000 workers. By now, however, 4,600 earth-moving machines, 16,000 tractor-dumpers and three lakh workers are being deployed. 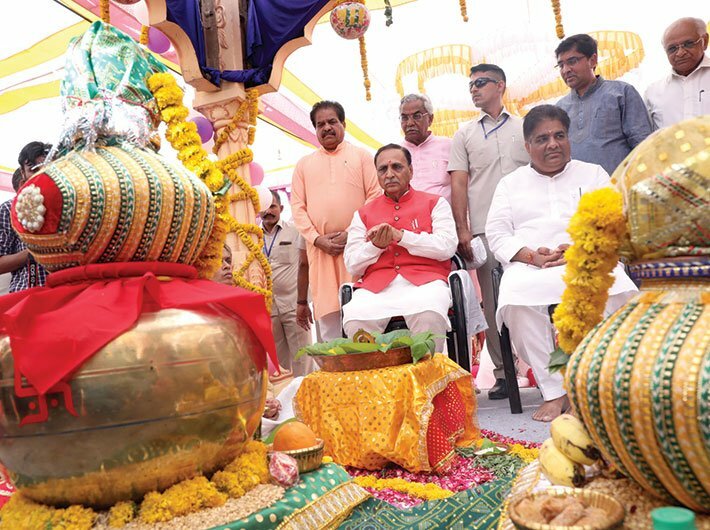 Rupani leaves no opportunity to target the opposition. “The Congress sees corruption even in its dreams,” he says, referring to allegations of Rs 2,400 crore corruption in the Rs 200 crore campaign. He says the Congress had even alleged “purchase scams” when grass was distributed free in Banaskantha. He describes the government’s efforts as having nothing to do with the elections and being pro-people initiatives aimed at future generations. The crowd bursts into applause. Water is in short supply, but there’s no crisis – this is what the Gujarat government has maintained for some time now. On March 15, the government stopped providing Narmada water for irrigation, saying it would be used only for drinking. The government even advised farmers not to sow summer crops. All indications that there hasn’t been enough rainfall in the catchment areas (in Madhya Pradesh) of the Narmada, considered the lifeline of Gujarat. Indeed, the water resources department says that in early June, there was only 27 percent water in the state’s 200-odd dams and reservoirs, totalling a capacity of 25,220.17 million cubic metres (MCM). The Sardar Sarovar dam has only 33.64 percent of its storage capacity of 3,182.48 MCM. “The Narmada has 48 percent less water this year. This year has taught us that we cannot depend on Narmada to fulfil our water needs. We need to strengthen and rejuvenate our traditional water resources,” says Mona K Khandhar, commissioner of rural development and secretary in the department for panchayat, rural housing and rural development. So the government has launched the mass-scale movement for water conservation with the involvement of locals, NGOs and corporates. Khandhar says the implementing agencies were even encouraged to take up works at their own cost, and the rest was done on a 50-50 sharing basis. “Moreover, the excavated silt, which is extremely fertile, has been given to farmers for using in their fields. The campaign has also generated employment as we gave work under the MNREGA and created 57.71 lakh man days,” says MK Jadav, secretary, water resources. The government is also planning to integrate afforestation and Swachh Bharat in the next phase of this campaign, says an upbeat Khandhar. The jal abhiyan will continue for another two years and its effectiveness and implementation will be carefully monitored. However, the opposition and critics cry foul over the initiative. In December, prior to the 2017 Gujarat elections, prime minister Narendra Modi undertook a seaplane journey on the Sabarmati. It is alleged that the party used stored dam water to fill the river for Modi’s smooth ride. They accuse the party of wasting water for electoral gains. Moreover, it was only after the BJP won the state elections that it issued warnings to farmers on water shortage. Therefore, the campaign to conserve water by deepening and desilting ponds and lakes in the state was conceived after much hue and cry. The BJP, of course, has denied these charges and maintains that the party is working for the benefit of people of Gujarat and wants to make the state “paanidaar”. In the wee hours of the morning, the Sabarmati riverfront in Ahmedabad looks serene with abundant water. A little over an hour’s journey from here is Chhatral village, in Kalol taluka of Gandhinagar district, where excavators are working in full swing to deepen a dry lake. The work will get complete in another two days, well before the monsoon arrives in the state, says Atul Shah, deputy engineer, irrigation department. After the rains, the freshly-dug tank will recharge ground water and raise the water table. Construction giant L&T has given machinery for this project under its CSR activity. Village people are also chipping in under the MNREGS. “There are 230 tanks in Gandhinagar district. Work has been done on 151. We have deepened and cleaned the already existing ponds and lakes. We did not dig any new ponds as that would have meant a lengthy process of getting clearances and all,” says Shah. Supervising the work with him is the grampradhan of Chhatral village, Dineshbhai R Patel. “The ground water level in my village has decreased a lot, and sometimes we have to dig 400 feet below to get water. This work will help us a lot. It will not only provide us water but also save our electricity. At present, we use a motor of 60-70 HP for pumping water. After the ground water gets recharged we might not have to use such high power,” he says. Though these efforts may look like too little, too late, yet the locals and officials are enthusiastic about it. At a time when many Indian cities are staring at a huge water crisis, Gujarat has at least woken up to the problem. Whatever the reasons, the scheme provides hope that the excess rainwater will not be wasted. Only time, rather, the monsoon, will tell if this campaign is able to reap benefits for the people and party.